There was actually a lot of sweater left over from the pumpkins but it really doesn’t take much sweater material to make these Sweater Carrots. I started with the left over sleeve. Cut a triangle, a long skinny triangle. It doesn’t have to be perfect because carrots aren’t perfectly shaped triangles or technically they would be cones right? Anyway, I saved myself some work by leaving one side of the sweater triangle folded and then cut the other side of the triangle. Then with right sides together use hot glue to close up the side opposite the fold. Just the side, leave the top open for now. Let the glue dry then turn your carrots right side out. You may need something to poke the point out like a pencil. Fill the carrot up with stuffing, fiber fill or whatever you have and shape your carrot while you fill. For the stem I used the green sweater. Cut a 5-6 inch strip of green sweater, then cut that down to about 1-1 1/2 inch strips. Make cuts in the smaller strips almost to the end, like pictured below. I don’t have a picture of this next step. But it’s similar to how I made the denim flowers here. With the cuts you have 3 (or more if you want) ends, loop those back and glue down then roll and glue. Last step is to tuck the top of the carrot in and leave a hole for the green stem part to sit. Holding the carrot this way worked best to do this job. Add glue and stick the glued end of the green stem in and hold for a minute. Keepin real for a minute….I made these sweater carrots while everyone was in bed. Nobody saw them until late the next day when I was showing my husband, who’s had a rather surprising reaction saying they turned out cute. He and my older kids quickly made a “but why” face. 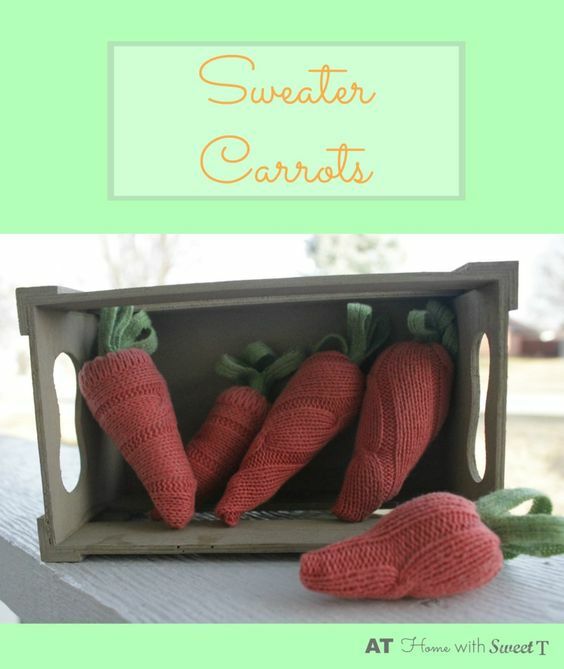 Why sweater carrots? For the Easter bunny of course. Duh! I thought they turned out cute and fitting for Spring/Easter. Do you get it?